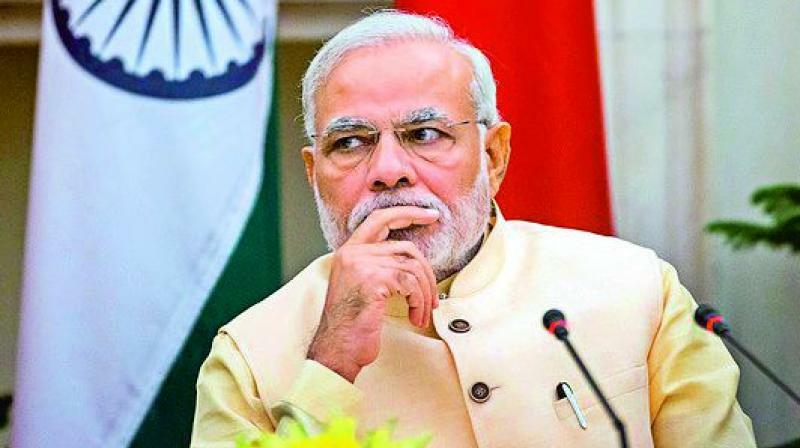 New Delhi, Nov 9: Prime Minister Narendra Modi's failure to implement his electoral promise of 50 per cent profit above the cost of production has resulted in about Rs 2 lakh crore loss to farmers in the country this kharif season, farmers unions said on Thursday. Addressing media persons here, the AIKSCC sought complete loan waiver and remuneration of 50 per cent margin above the cost of production as per Modi's promise. In last few months, AIKSCC leaders held several rallies across the country to unite farmers on these issues, saying there would not have been farmer suicides if the government had not "looted" them. On November 20, a draft Bill encompassing the two demands will be introduced in the Kisan Mukti Sansad and it will be debated and passed by the farmers' Parliament. "We will invite the leaders of political parties and Prime Minister to come to the sansad if they are ready to support the Bill and the demands," said V.M. Singh, convener of the AIKSCC.